Corylus is a genus of around 10 species of deciduous trees and shrubs from temperate woodland regions. They have alternate, rounded or oval leaves. As bonsai, most forms of Corylus are considered to have too large and coarse leaves to be displayed during the growing season. However, after leaf-fall, their rugged bark and catkins make for excellent winter displays. During the late-Summer and early Autumn, Hazels produce edible nuts. 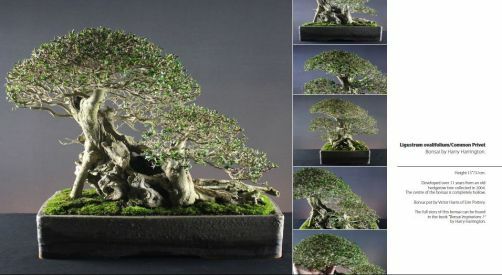 In Europe it is Corylus avellana / Common Hazel that is most frequently seen as bonsai. This is an upright tree-like shrub to 5metres in height with broadly heart-shaped, toothed, mid-green leaves to 10cm long. During the winter, it bears small pendant yellow catkins to 4cm long which remain on the tree until early Spring. Corylus avellana 'Contorta' / Corkscrew Hazel is a form that has naturally twisted growth creating an excellent twisted and distorted trunk and branch structure. (The 'twisting' habit is due to a naturally occurring virus that does no harm to the tree other than to create accelerations in growth unevenly across the width of a shoot. This results in new shoots that cannot grow straight and true. Corylus species are related to Birches and are members of the same broad family Betulaceae, other 'Hazels' such as Winter Hazel / Corylopsis species and Witch Hazels / Hamamelis species are not closely related (though of a similar appearance) and are members of the Hamamelidaceae family. POSITION Full sun, partial shade in summer. REPOTTING Every two years in early Spring before leaf-buds extend. Use basic soil-mix. PRUNING Trim new growth through the growing season in preparation for good Autumn and Winter display. Hard pruning or formative pruning should be carried out around March after catkin display has finished but before new growth leafs out. PROPAGATION Sow seed outside as soon as ripe in Autumn. Ground layer in Autumn or airlayer in late-Spring. PESTS AND DISEASES Caterpillars, mites, sawflies and aphids. Can be affected by powdery mildew. STYLING Suitable for all forms except formal broom and literati in medium to extra-large sizes.